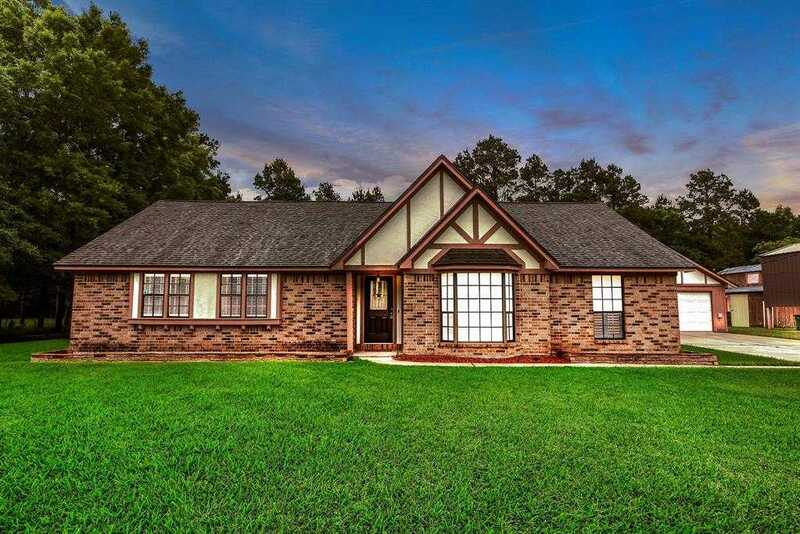 Resting on a tranquil 1.8 Acres just MINUTES away from The Woodlands and I-45, this Non-Restricted Homestead features a custom built, 2255 SQFT 3BR 2 Bath Home with a Flex-Room located adjacent to Master Bedroom. The Floorplan offers a living/dining area upon entry that could serve as a formal den/dining combo, vaulted ceiling with wood beams in the family area and Wood burning fireplace situated in the corner. Kitchen area partially opens to living with breakfast and bar area. Ample sized bedrooms and closets, Master bedroom featuring his and her closets, walk-in shower and custom built-ins. Exterior features 2-Car OVERSIZED Garage with 220 amp breaker running to the adjacent RV Cover with an additional 25×25 Metal shop with built-in shelving and workspace. 2 Stall barn w/ tack room located on the rear of the property. ADDITIONAL HIGHLIGHTS: 240′ Water Well w/ softener Aerobic Septic ROOF 2018 Circle Driveway 3/4 Iron Wrought Fence w/ 2 Automatic Gates LOCATION! !